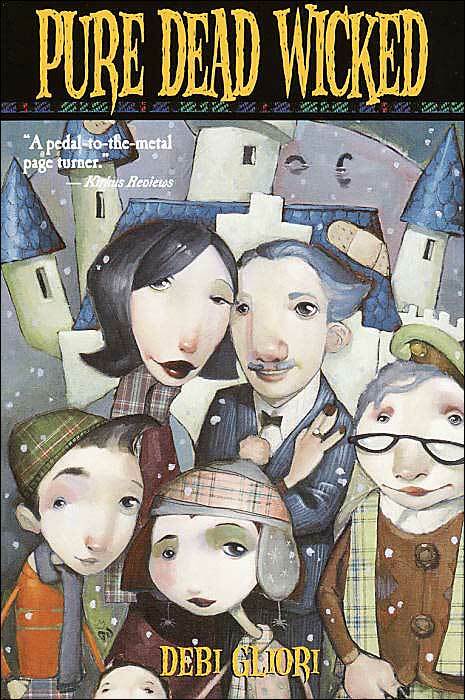 At first sight the Strega-Borgia family looks perfectly ordinary. There is a father, mother, three children, a butler, and a nanny. However, when you go and visit them you will find that they are a little different from your everyday next door neighbour. For one thing, they have a pet crocodile, a pet griffin, and a pet dragon. Then there is the fact that Signora Strega-Borgia is learning how to be a witch. Added to this is the fact that Strega-Nona, the family matriarch, is residing in the freezer chest in the dungeons of the family home. No indeed, these are not your run-of -the mill neighbours, though they do have run-of-the mill problems sometimes. At the moment their chief problem is that the roof of their house, Stregaschloss, is a disaster area. There is nothing for it but for the whole family, with their unusual pets, to move out of the Stregaschloss while the roof is worked on. They decide that they will stay at the inn in a nearby village, and from the moment they arrive things start to go wrong. It all begins when the dragon, Ffup, sets fire to the table cloth in the dining room. Then Titus, the son in the family, decides to clone his sister Pandora, and the results of his experiments in cloning at quite horrific. Soon the inn is crawling with horrible little pink clones who have a mind of their own and who won't do what they are told. Unbeknownst to the Strega-Borgias, the man whom they have hired to work on their roof is not in the slightest bit interested in making their home livable again. Quite the contrary. He is determined to make the house so inhospitable that the Strega-Borgias will be dying to get the house, and and the very valuable land it is sitting on, off their hands. In the pay of a local developer who wants the Strega-Borgia land for himself, the roofer begins to wreck havoc in the house. One thing that he doesn't realise is that taking on the Strega-Borgia family can be very dangerous to one's health. In fact, it can even be fatal. This deliciously funny book will have readers laughing out loud at the terrible situations and messes that this wonderful family gets itself into. Sometimes they just seem to stumble into disasters ,and at other times they bring them about, though they always mean well. Packed with tongue-in-cheek humor that will amuse older readers, this is a book that will leave the reader with a smile on his or her face long after the last page is read.